Clinical preventive services, such as disease screening and immunizations are key to reducing death and improving the Nation’s health. Among adults age 50 to 75, the rate of NOT getting the recommended screening for colorectal cancer for those with less than a high school education was about twice that for the population with an advanced degree (age adjusted). 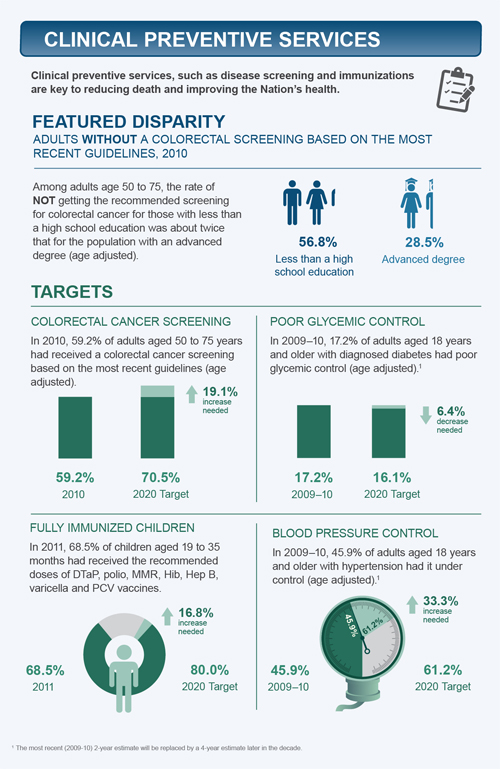 In 2010, 59.2% of adults aged 50-75 years had received a colorectal cancer screening based on the most recent guidelines (age adjusted). In 2011, 68.5% of children aged 19 to 35 months had received the recommended doses of DTaP, polio, MMR, Hib, Hep B, varicella and PCV vaccines. 1The most recent (2009–10) 2-year estimate will be replaced by a 4-year estimate later in the decade.